Left - BEADED CABLE - Cobalt Blue - Courtesy Mickey Reichel. Right - BEADED CABLE Rosebowl in White. 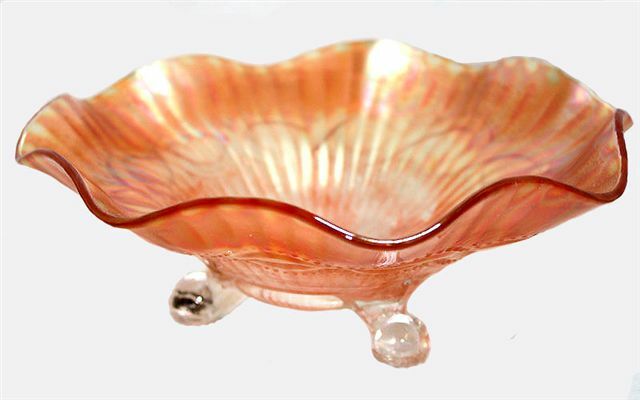 SMOOTH RAYS interior - Beaded Cable Candy Dish - 7 in. diameter. BEADED CABLE / Smooth Rays Exterior: Popularity of this mould extended from 1903, as part of the Mosaic (purple slag) line, to opalescent production three years later. 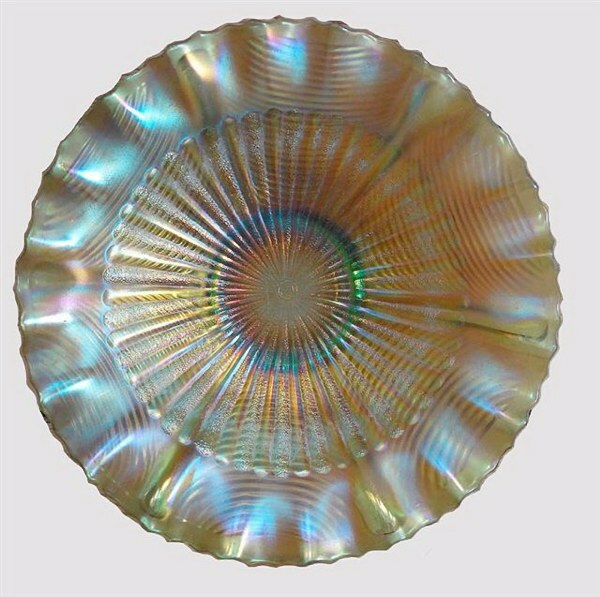 The lengthy production of carnival glass began in 1909. 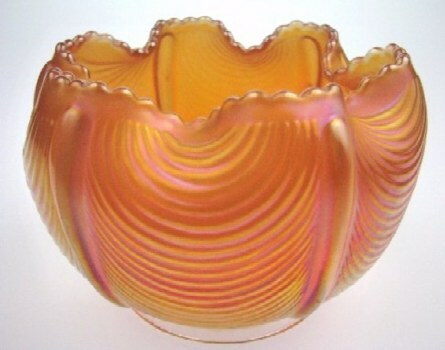 It was a staple of iridescent production for nearly six years before enjoying a run in custard glass production during the 1914-1916 period. 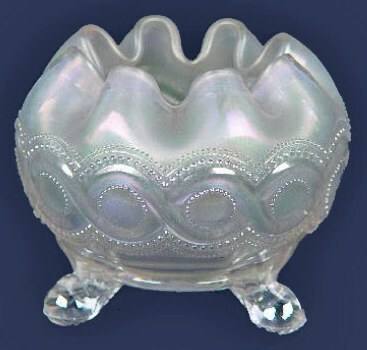 Both the rosebowl and candy dish can be found having either a plain or rayed interior. N. STIPPLED RAYS PCE 9 in. Bowl having DRAPERY Ext. - Green. 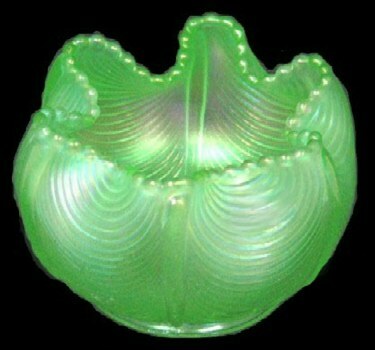 Unusual DRAPERY Exterior on Northwood STIPPLED RAYS Bowl - Green. STIPPLED RAYS / Drapery Exterior: This unusual example has turned up in recent years, having the pie crust edge and Drapery exterior pattern. 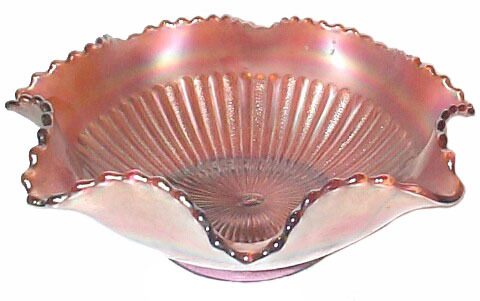 Northwood’s version of the 8”-9” Stippled Rays bowls was produced in large quantity in the 1909 time frame. All known examples are trademarked. Left - DRAPERY Rosebowl - Marigold. Right - Lime Ice Green DRAPERY- $900. Jan. '08 Reichel Auction. 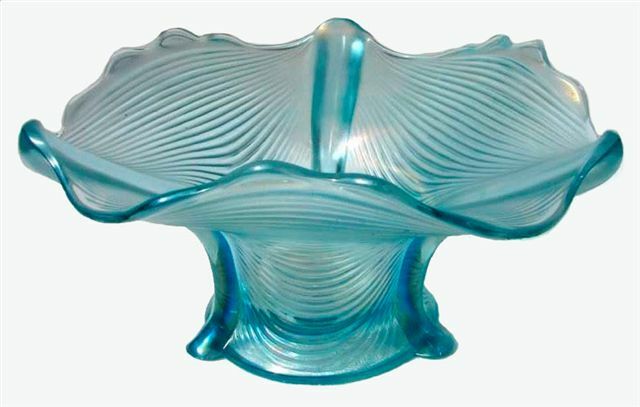 Northwood DRAPERY Candy Dish - I.B. 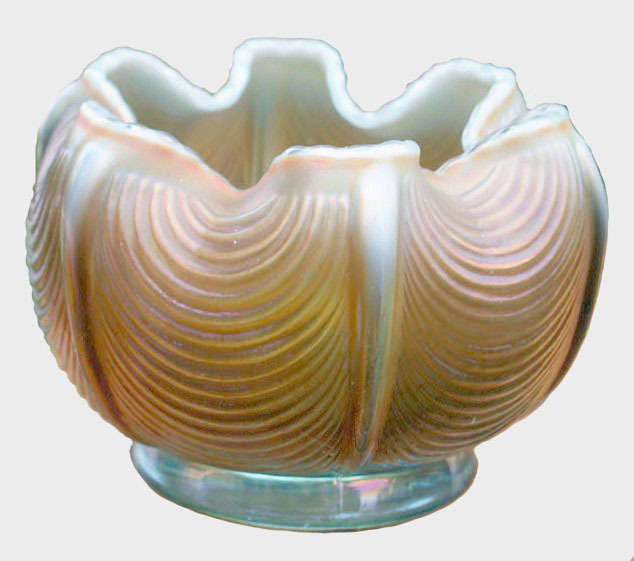 - Same mold as vase. Nine inch Marigold STIPPLED RAYS with PLAIN Exterior. 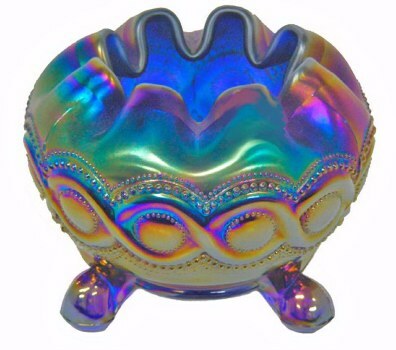 Amethyst Stippled Rays bowl interior - 9 inch. 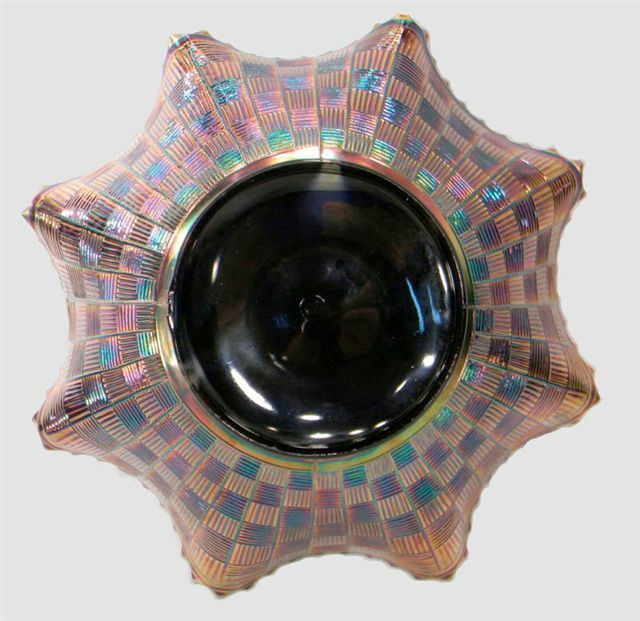 Amethyst Stippled Rays bowl with Basketweave exterior - 9 inch. 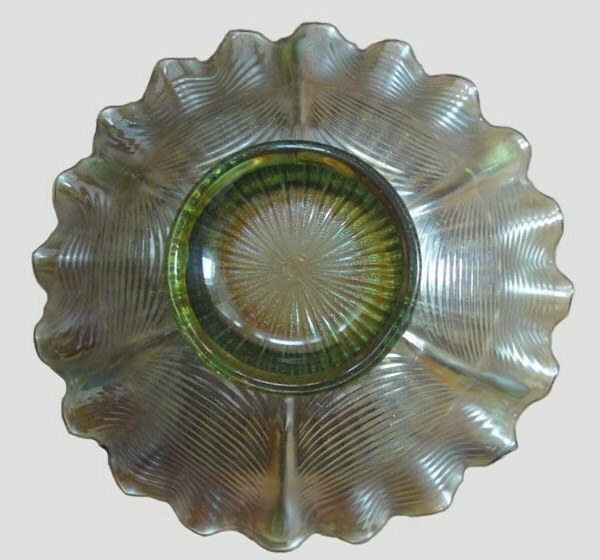 BASKETWEAVE: The pattern was widely used during the 1908-1912 period as an exterior for marigold, amethyst and green 8”-9” bowls, 9” plates, compotes and bonbons. 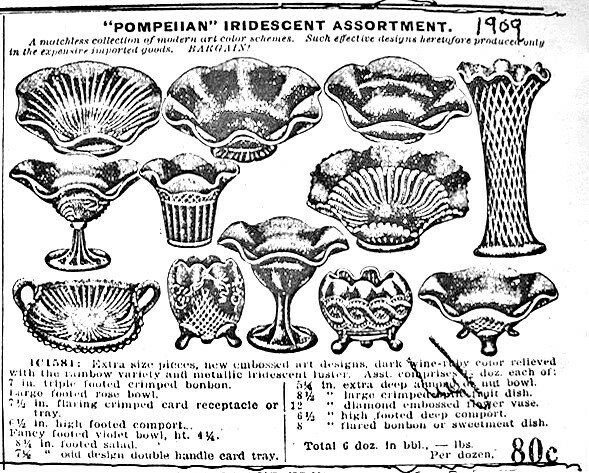 In years following, usage of ribbed exteriors prevailed. When Basketweave appears as the exterior design with an un-patterned interior, collectors/writers refer to it as “Northwood’s Rainbow”. 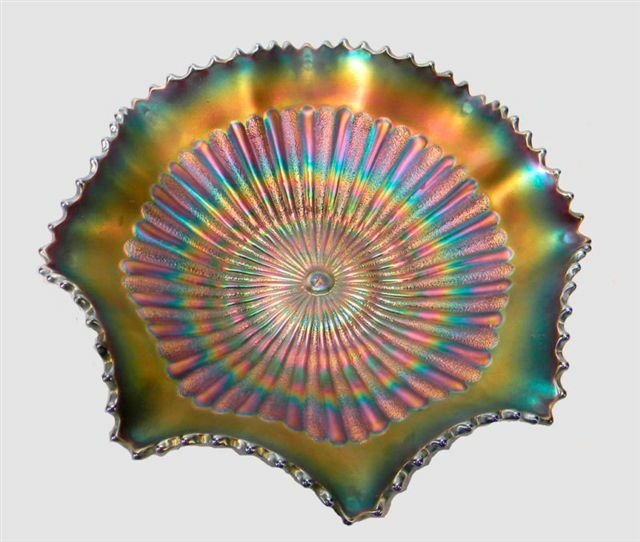 Amethyst is the dominant color, but marigold and green examples do exist.